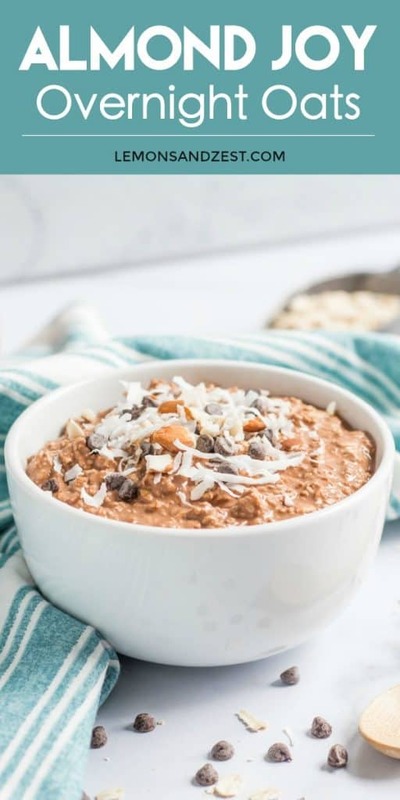 Chocolate, coconut, and almond come together in this simple breakfast recipe that you can make ahead and have breakfast ready on the go. 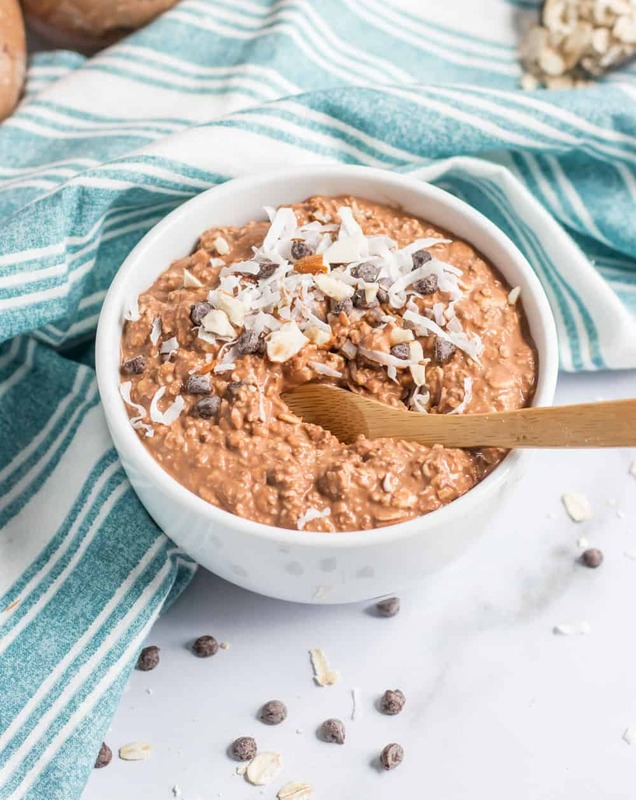 Almond Joy Overnight Oats are a hearty and healthy way to start your day! Overnight Oats are by far one of my favorite breakfasts. They make rushed mornings a breeze because they are ready to grab and go in the morning. You can make enough jars for the whole week in about 15 minutes. Nothing compares to the convenience. When you are on the go, having to do one more thing is not always going to happen, but when you are hungry, you are hungry. Gotta eat! I am quite the coconut fanatic. I was always a fan of Almond Joy bars. 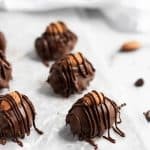 The gooey coconut surrounded by rich dark chocolate and topped with an almond was the perfect combination. Now that I have my own version of the bars (link to Almond Joy Bars), I decided it was time to take Almond Joy to the breakfast table. When people see the word ‘chocolate,’ they often automatically think unhealthy, but that is not the case at all. There is so much that it can do for you–especially its mood boosting qualities, right?! Needless to say, our bodies are nourished by chocolate! 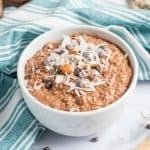 If you are an Almond Joy fan like me, then you will love these Almond Joy Overnight Oats! So dig in to chocolate, almond and coconut goodness! 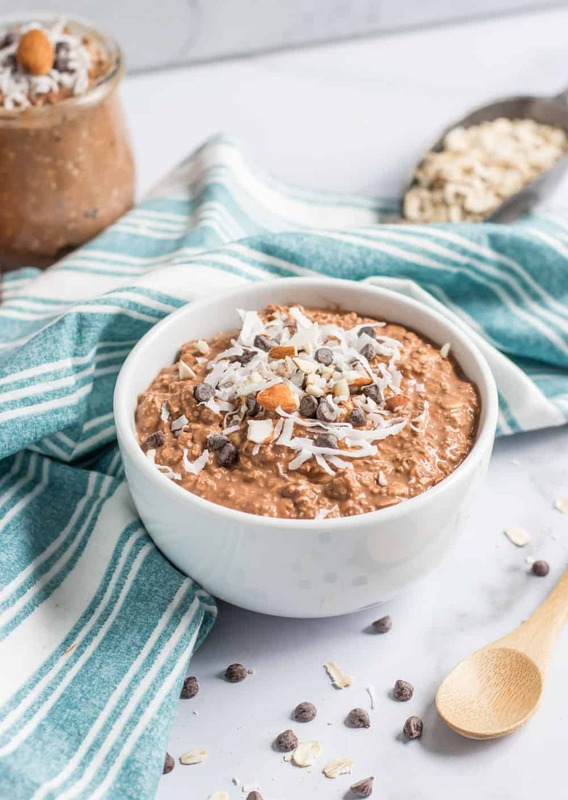 Love overnight oats? 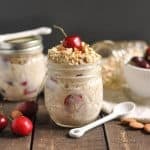 Check these other Overnight Oats recipes out! There are so many flavors to choose from–promise there is one for everyone! *Photos updated Dec. 20, 2018. Combine all ingredients into a jar or container that can be sealed. Serve cold or warm up in the microwave to serve hot. Optional garnish: mini dark chocolate chips. Almond extract can be super strong. I advise putting the smallest amount possible or it can be a bit too much. I have tried 4 of Lorie’s overnight oats recipes now. Though this is good, for me personally, it’s a little too much chocolate in the morning. That said, I confess that I am a woman who is NOT addicted to chocolate. Yes–I said it! I am in the minority of the female gender, I know!! Who doesn’t want more chocolate? But Lorie’s picture was just too appealing not to give it a go! 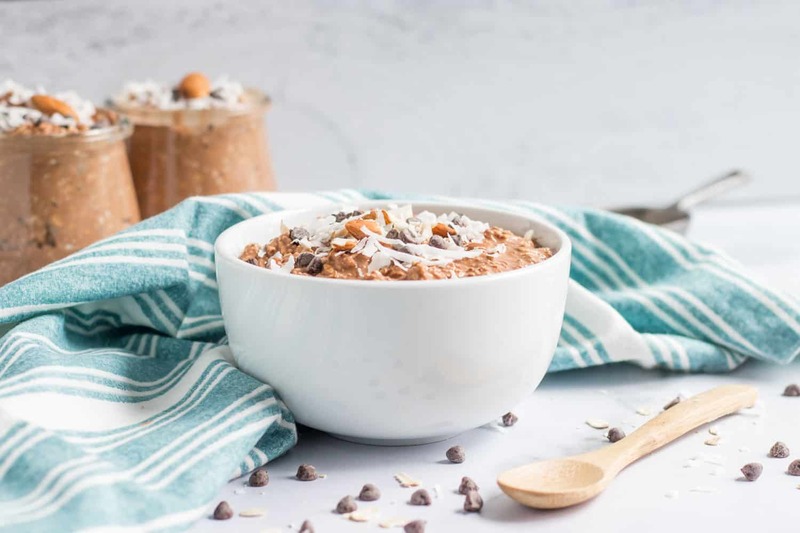 If you are new to Overnight Oats, start with Lorie’s Banana Bread Overnight Oats. Tomorrow morning will be my second serving if it. Too Good!! Amen, Cathy! The Banana Bread oats are where it’s at! And I so get it, chocolate in the morning can be a bit much. Sometimes I have this one as an afternoon snack! 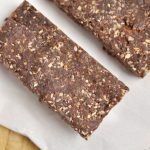 I tried these with the steel cut oats and found that they just didn’t soften enough-even after 3 days in the fridge, even with cooking for 10 minutes on the stove in the morning. The taste was very good though, so I’m looking forward to trying it again with rolled old-fashioned oats and seeing if those will soften. Hi Millie, thanks for the feedback! I don’t care for the steel cut oats in these either but some people love the chewiness. Definitely go with the rolled! If I make 5 jars for the entire week on Sunday night, will they still be just as good on Friday morning? The overnight oats like this one without fruit in them have been fine for me 3-5 days later even. As long as you don’t put anything like banana in them you should be good!